The Maria Camahort Quintet was established in November 2011 out of the desire to increase the possibilities in chamber music. 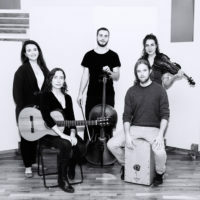 Guitarist Maria Camahort arranges the repertoire and leads this project created alongside four other talented musicians: Violeta García, voice and violin; Laura Ruhí-Vidal, soprano; Sergio Serra, cello; Pablo Domínguez, percussion and guitar. The originality of the ensemble is given by the intense collaboration between musicians from different musical traditions, by its characteristic timbre, and by the specific choice of classical repertoire and their adaptation to this particular quintet. The Quintet has already performed at some of the top venues and festivals, including St Martin in the fields, The Forge, Kings Place, Southbank Centre (Purcell Room), St James’s Church PIcadilly, St Michael at the North Gate (Oxford), Bath Guitar Festival, London Guitar Festival, Kings Place Festival, and Edinburgh Guitar and Music Festival. Forthcoming performances include Buxton Festival and Kings Place Festival 2015, and the Milton Court (Barbican). Their debut album ‘Iberian Colours’ will be a representation of the vibrancy of Spain in sound, bringing to the audience the musicality, the flavour and the stories that are held in the music of Spanish composers.